Building a positive culture of safety, high-potential risk control, occupational health and hygiene, and our safety performance against leading and lagging indicators. Technology and innovation have the potential to reduce human involvement in high safety risk activities, remove workers from high-risk areas, and develop systems for hazard and operator fatigue identification.3 We continue to look for opportunities to take advantage of these technologies, as we know protecting the health and safety of our workforce is fundamental to achieving long-term success and upholding our commitment to sustainability. In 2018, our High-Potential Incident Frequency was 28% lower and Total Recordable Injury Frequency remained the same as in 2017. Lost-Time Disabling Injury Frequency also remained flat year over year. We were deeply saddened by two fatalities that took place this year, one at our Fording River Operations and one at our Elkview Operations. We have carried out in-depth investigations into each of the incidents to learn as much as possible and to implement measures to prevent reoccurrences. These fatalities serve as an important reminder that we must remain diligent in our efforts to achieve our vision of everyone going home safe and healthy every day. 1 Safety and Health at Work. International Labour Organization. 3 Mine 2018: Tempting times. PwC. 2018. The Board of Directors, through its Safety and Sustainability Committee, broadly oversees health, safety, environment and community policies, systems, performance and auditing, including implementation of our Health, Safety, Environment and Community (HSEC) Management Standards. Health and safety incidents are reported as they occur, in monthly company-wide performance reports and on a quarterly basis to the HSEC Risk Management Committee, which is made up of several members of our executive management team. We also have an executive Health and Safety Advisory Committee to evaluate and inform health and safety policy change and initiative planning, and to provide additional oversight of performance. For executive compensation, health and safety performance is measured through year-over-year statistics on lost-time and disabling injury frequency and on high-potential incident frequency, together with our performance against leading indicators based on our strategic objectives. Using both leading and lagging indicators aligns our bonus plan payout levels with how well we manage and evaluate health and safety performance across Teck. Our Health and Safety Policy outlines our commitment to providing leadership and resources for embedding core values of health and safety across our company. Health and safety is also included within our Code of Sustainable Conduct, Expectations for Suppliers and Contractors, and Code of Ethics. Mining Association of Canada (MAC): Promotes the development of Canada's mining and mineral processing industry. Through MAC, we are required to implement the Towards Sustainable Mining program, which aids in improving industry performance. We have a three-pillar approach within our current health and safety strategy: building a positive culture of safety, identifying and effectively controlling our high-potential risks, and enhancing our prevention of occupational disease. 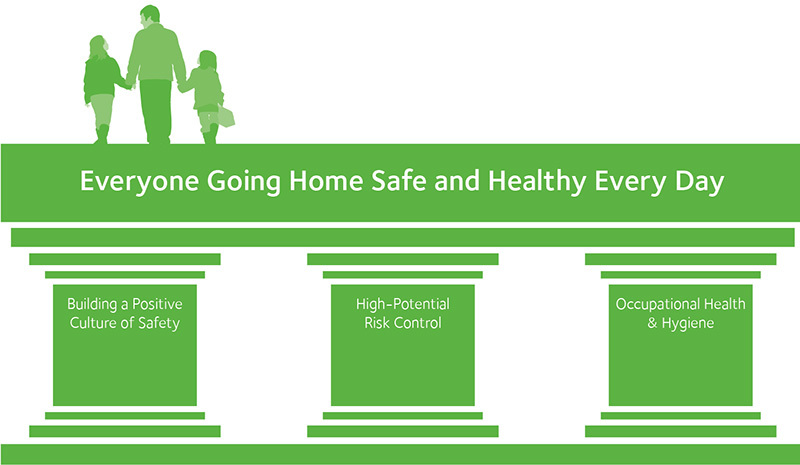 These three areas drive continual improvement and support our vision of everyone going home safe and healthy every day. We continuously seek to strengthen and achieve a balance between the cultural and technical aspects of our health and safety program and ensure that these two aspects are complementary with one another. Teck’s Courageous Safety Leadership (CSL) program focuses on challenging existing values, beliefs and attitudes towards health and safety, and builds commitment from individuals to work in a healthy and safe manner. The program, rolled out in a series of phases, seeks to empower every employee to be a leader in health and safety by playing an active role in his or her own health and safety as well as the health and safety of those around them. Our most recent phase of CSL supports supervisors and other positional leaders in being an effective health and safety coach within the teams that they manage. They help our teams actively explore and respond to their health and safety strengths, opportunities and safe production challenges. I am empowered to be courageous. I must speak up if my safety or the safety of those around me is affected or can be improved. To proactively identify and mitigate high-potential risks, we maintain our High-Potential Risk Control (HPRC) strategy at all of our operations. This program focuses on improving the way we identify, implement and evaluate the controls that will most effectively prevent serious injury or loss of life. What are our high-potential risks? What critical controls — measures that, when implemented, are more effective in preventing an unwanted event — do we have in place to manage these risks? What processes do we have in place to give ourselves the confidence that our controls are effective? Employees across the business undertake Work Team Risk Assessments to help answer these questions, look for gaps and work together to close them. Follow-up effectiveness reviews help to validate that changes from risk assessments are being put into practice. Progress on the Work Team Risk Assessments is tracked on a monthly basis and it is considered as a component of Teck’s bonus plan. We track all safety incidents and classify significant incidents as High-Potential Incidents (HPIs), Serious HPIs or Potentially Fatal Occurrences (PFOs). We are committed to investigating all significant incidents to comprehensively understand root causes and take actions to prevent recurrences. Using the Incident Cause Analysis Method (ICAM), we consider the contributing factors at the individual, team and organizational levels that led to each incident. Analyzing and learning from these incidents allows us to better identify and target actions for high-risk factors across our operations. In accordance with our Occupational Health and Hygiene Strategy, we limit worker exposure to harmful substances by understanding our exposure risks and by providing personnel with suitable controls to protect their longer-term health, custom fit for their body type and size. Our Occupational Health and Hygiene Committee leads development of our occupational hygiene programs. These programs are designed to limit worker exposure to potentially harmful substances and other sources of occupational disease. This includes exposure to dust, noise, vibration and hazardous chemicals. Our Teck-wide standard — Requirements for Occupational Hygiene Programs — provides consistent guidance for the management and monitoring of occupational exposures across the company. The Committee has also developed a standard training program to ensure our hygiene sampling efforts produce high-quality monitoring data on which to evaluate our progress. All operations have developed exposure reduction plans, and progress is tracked as part of monthly health and safety reporting. Progress against our plans is also a component of our bonus program. Our company-wide Health and Wellness program focuses on improving the physical and mental well-being of our employees. Programs under this strategy include mental health campaigns, flu clinics, fitness facilities, and site-specific health and wellness workshops. One of the most successful initiatives under the program is our Know Your Numbers Campaign, which provides free cardiovascular health screening that measures several indicators, including blood pressure, cholesterol, casual glucose and body mass index. In addition, our employee benefits program, which varies by country of operation, provides access to a variety of wellness services, including counsellors, naturopathy and nutrition planning. Teck maintains drug and alcohol policies that include pre-employment and post-incident testing. Outside of Canada, all of our operations have drug and alcohol policies that allow for testing, including random testing as permitted under local laws. Our sustainability strategy outlines our goals in relation to continuously improving health and safety at our operations. This year, we continued implementation of the fourth phase of our Courageous Safety Leadership (CSL) program. Launched in 2009, CSL focuses on challenging existing values, beliefs and attitudes towards safety, and builds commitment from individuals to work safely and foster safe practices at our operations. Building on previous phases of the program for both employees and contractors, CSL4 requires front-line leaders to facilitate a six-hour session with their teams to explore our company’s, and their team’s, culture of safety — including safety strengths, safety opportunities and safe production challenges. For each of these areas, they identify and select commitments to work on as a team to help improve their safety journey. They must also identify a means to hold each other accountable for achieving their commitments. In 2018, we trained approximately 97% of employees on CSL4, and employee feedback on the program was positive. In addition to CSL4, a new Introduction to CSL program was rolled out across the company in 2018; all new hires are required to complete this within approximately six months of joining the company. As part of Teck’s culture of safety, it is critical that new employees and contractors understand the importance of CSL, the journey we have been on to develop our culture of safety, and the part they can play in moving it forward. As part of our High-Potential Risk Control (HPRC) strategy, we set a target for each operation to complete four Work Team Risk Assessments and four Effectiveness Reviews in 2018. The Corporate Health and Safety team supported operations to reach their target by undertaking HPRC coaching sessions across operations to review risk assessment and effectiveness quality. As of the end of the year, all operations met or exceeded their targets for 2018. As a result of our improved risk assessment efforts across the company, we identified and shared stories of positive change. Teams across the company have tightened their controls for several key serious injury and fatality risks. We will continue to identify and share more stories in 2019. In 2018, we also released new company-wide standards for Fitness for Work and Working around Water. The purpose of the Fitness for Work standard is to establish the expectations across Teck business units and operations to reduce safety risk for all employees, including risks related to fatigue and impairment. Mining and mineral processing activity can also expose workers to the hazard of working on or around water and tailings storage facilities. The Working around Water standard contains the minimum requirements for working in these conditions. We work to continuously enhance our occupational health and hygiene risk assessments, monitoring and exposure controls to protect the long-term health of employees. In 2018, all of our operations were required to implement the Exposure Reduction Plans (ERP) they developed in 2017. By the end of the year, 11 out of 12 operations reported that they were on track with their plan implementation. Our Occupational Health and Hygiene Committee implemented a comprehensive sampling training program in 2018. The objective of the program is to provide all personnel who have a role in collecting hygiene samples with standard training for the collection of quality samples — including the collection of respirable particulate samples, and noise monitoring and mapping. An Occupational Medical Specialist, Dr. Lawley, joined Teck’s Health and Safety team in 2018 to help understand the needs of employees and operations in the area of occupational health. In the communities where we work, Dr. Lawley has started to build relationships with local health authorities and providers, to support our occupational health programs. We are deeply saddened to report that in 2018 we had two fatalities. On April 9, 2018, an amphibious excavator overturned in a tailings pond at our Fording River Operations, resulting in the death of a contractor. To ensure we learned everything possible from the incident and to help prevent a reoccurrence, an animated re-enactment has been produced and is being shared across our company and industry. View the video here. On November 18, 2018, a vehicle collision occurred at our Elkview Operations, resulting in the death of an employee. Following a full investigation, learnings from this incident will also be shared across the industry. We share learnings from these incidents because we believe that these tragedies would be compounded if we fail to learn from them and fail to share those learnings with others. In 2018, our High-Potential Incident Frequency was 28% lower and Total Recordable Injury Frequency remained the same as in 2017. Lost-Time Disabling Injury Frequency also remained flat year over year. Teck’s TRIF is slightly above the average compared to the ICMM, which is made up of many of the world’s largest mining companies. (1) Our safety statistics include both employees and contractors at all of our locations (operations, projects, closed properties, exploration sites and offices). For sites where Teck owns more than 50%, safety statistics are weighted 100%; for sites where Teck owns 50% or less, safety statistics are weighted according to Teck’s ownership of the operation. This includes Antamina mine, in which we have 22.5% interest. We define incidents according to the requirements of the U.S. Department of Labor’s Mine Safety and Health Administration. Severity is calculated as the number of days missed due to Lost-Time Injuries per 200,000 hours worked. (2) Increase in severity in 2018 is a consequence of two fatalities, which are automatically counted as 6,000 lost days. (3) A Lost-Time Injury is an occupational injury that results in loss of one or more days beyond the initial day of the injury from the employee's scheduled work beyond the date of injury. (4) A Disabling Injury is a work-related injury that, by orders of a qualified practitioner, designates a person, although at work, unable to perform their full range of regular work duties on the next scheduled work shift after the day of the injury. (5) A fatality is defined as a work-related injury that results in the loss of life. This does not include deaths from occupational disease or illness. (6) Frequency indicators in this table are calculated by the number of events in the period multiplied by 200,000 and divided by the number of exposure hours in the period, which refers to the total number of actual hours worked by employees/contractors at a site where one or more employees/contractors are working or are present as a condition of their employment and are carrying out activities related to their employment duties. Hours of exposure may be calculated differently from site to site; for example, time sheets, estimations and data from human resources are inputs into the total number of exposure hours. We report the incidence of occupational diseases at Teck, based on accepted workers’ compensation claims from each jurisdiction in which we work, for the disease categories set out below. For Tables 6 to 8, workers’ compensation claims data are for accepted claims over the past four years, and are for employees only; contractor data is not included. In some cases, as our systems for reporting occupational diseases continue to mature, occupational disease cases and rates may increase in the short to medium term. This is a reflection of the long latency period associated with the development of occupational disease. However, at the same time, we will also continue to enhance our application of improved risk-based controls to prevent occupational diseases. Process safety events are those that typically involve an unexpected mechanical integrity failure in a pipeline system or processing facility that may result in a fire, explosion, rupture or hazardous chemical leak. All high-potential incidents (including process safety events) were thoroughly investigated to identify corrective actions to minimize the potential for reoccurrence. (1) Does not include global exploration or marketing offices. (2) Occupational diseases are defined as an adverse, generally chronic and irreversible health effect associated with overexposure to chemical, physical or biological agents in the workplace (e.g., silicosis, bladder cancer, berylliosis, metal fume fever, asthma). (3) The reporting for hearing loss may be under-reported, due to limited data availability. In 2018, there were four Potentially Fatal Occurrences reported at Teck-operated locations that were investigated and for which corrective actions were developed. Where relevant, the results are shared with all of our operations in order to facilitate a local gap analysis against the findings to prevent similar occurrences. While our total High-Potential Injury (HPI) frequency and severity has declined since 2010, our business units and operations continue to experience HPIs. As such, we continue to focus on improving our understanding of high-potential risk and control effectiveness. Safety is a core value at Teck, and we are committed to continuously improving our performance. In 2019, we will continue to focus on reducing serious injuries and eliminating fatalities by ensuring our high-potential risks have effective controls in place and by enhancing our culture of safety. We will begin to implement our Introduction to Hazard Identification training program and practise these skills in the workplace. We will also continue the implementation of our Introduction to Courageous Safety Leadership program for new employees and conduct our second company-wide survey of safety culture. Our efforts to improve occupational health and hygiene monitoring, and improve exposure controls to protect the longer-term health of workers will also continue.